Are your SEO practices in line with Google Hummingbird? Customers earnest about getting and maintaining a quality online success have consistently invested time and effort in selecting the right keywords for their website and inbound marketing channels. Why? Because Google will recognise these and will index your site accordingly; done well and consistently, Google will give your site the rewards you seek with higher search engine results positions. If you thought you’d grasped what needed to be done, Google changes the rules and in flies Hummingbird. It’s probably the most significant change to Google’s search rules in 13 years, reportedly affecting a massive 90% of all searches. Now it’s more important than ever that you have quality inbound organic referrers to your website, i.e. visitors referred to your site by other websites. The Hummingbird change means that searches are now totally secure, suggesting that keyword analytics data could well be a thing of the past! Basically Google has switched all of its searches over to encrypted searches using HTTPS. This means no more keyword data will be passed to site owners and website owners will no longer have the ability to track users by their keyword searches. Other search engines will still send keyword data through to help with your analytics and keyword development. The exact way the Hummingbird algorithm works is not 100% clear, however it appears Hummingbird looks at over 200 different components when determining the search rank for a site much like previous releases. However previously Google would focus on the specific keywords where as now, with Hummingbird, the focus is on the context of the words entered and the matching of that meaning to web pages to which it relates; web pages matching the meaning do better than pages matching just a few keywords. This is a good thing overall and will kill the trend of content writers damaging the copy of their content trying to achieve “the right level” of keyword stuffing. What is clear is that if you are to maintain leading positions in Google search engine results your emphasis now needs to shift to the breadth of your website and to answering of specific questions for your audience. As has always been advocated by search engine marketing professionals, quality content remains key, it is that that your customers have and will continue to want to see irrespective of Hummingbird, but now the more the content aligns with answering specific customer questions, the more likely your page positions will prosper under Google Hummingbird. In short, the new Hummingbird algorithm is trying to measure the quality and how valuable and helpful your website is in answering customers’ questions. The key is therefore having as many unique entrance pages on your website as possible offering breadth, help and expertise on many relevant topics, plus of course relevant peer backlinks. 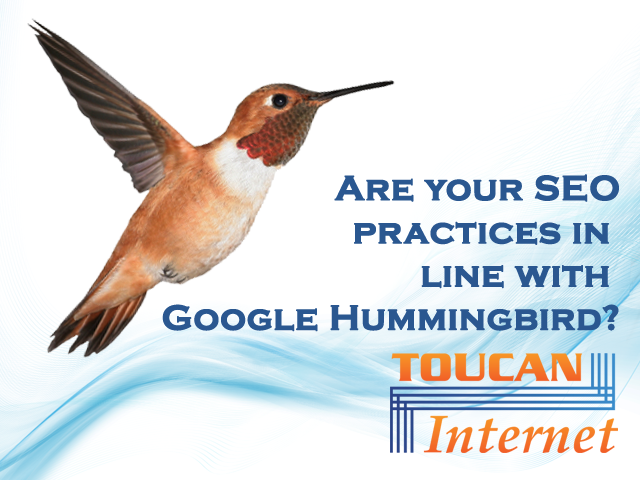 Are your SEO practices in line with Hummingbird? If you review your Google Analytics since Hummingbird was introduced in late August you will be able to see if there has been any decline in your website visitors. However, if you are to maintain and improve your search position you will need to reflect upon your whole online content strategy and the links to your site/content both on site and backlinks from other website and your inbound marketing from your social media. Make sure you focus on growing the number of relevant links and the quality, breadth, depth, frequency and value of your content if you are to maintain and improve your search position.